Today, the President signed the America Invents Act, bringing about the most significant changes to U.S. patent law in more than half a century. While most commentary centers around the shift by the U.S. to join the rest of the world’s “first to file” system — in which priority for a patent goes to the one who wins the race to the Patent Office instead of the one able to prove he invented something first — I want to focus on a more obscure provision of the Act. Bear with me while I begin with Greek mythology. 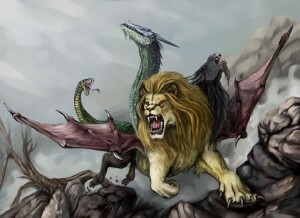 Homer described the Chimera in the Iliad: “a thing of immortal make, not human, lion-fronted and snake behind, a goat in the middle, and snorting out the breath of the terrible flame of bright fire.” A monstrous creature, the sight of which foretold any variety of natural disasters, the Chimera was ultimately defeated by Bellerophon, who shot her from the winged horse Pegasus. One of the achievements of modern biological research has been the ability to create fusions of different organisms by combining embryos from different species — “interspecies chimeras.” The cells intermix and the organism continues to include cells from different species as it grows. 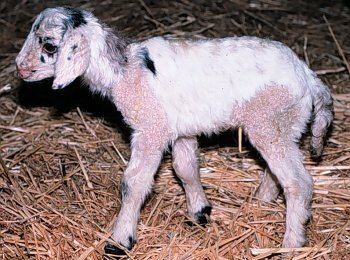 One of the more famous interspecies chimeras is the “geep,” an organism created in 1984 by scientists who fused a sheep embryo with a goat embryo, and which successfully grew to adulthood. By any measure, the geep is a peculiar-looking creature, with portions of its skin covered in hair (that grew from the goat embryo) and portions covered in wool (that grew from the sheep embryo). Ever since their creation, many have debated whether their legitimate scientific value outweighs the very common initial reaction that they are too bizarrely unnatural. Shortly after the cloning of Dolly the sheep in 1997, when public attention was focused on the ability of biologists to circumvent natural processes in the creation of lifeforms, Stuart Newman, a professor at New York Medical College in Valhalla, New York, submitted a patent application for a human-nonhuman chimera. A copy of the application can be found here and makes for interesting reading (perhaps unusually so for a patent application). Dr. Newman has always been clear on his motivations for filing such a patent application, asserting that he never had any intention of producing humanzees, bahumans, or any other type of human-nonhuman chimera. Rather, he was concerned by the legal environment in which the Supreme Court appeared to be giving real effect to the desire expressed by Congress in 1952 that a patent be available for the invention of “anything under the sun that is made by man.” Indeed, I commented several months ago here that roughly 12% of each of our bodies is estimated to be subject to some form of patent coveage. As a scientist who came of age in the 1960s, I had witnessed the damage that could be wrought by using the products of research and technology without appropriate constraints. The list is long…. My objective in filing the application was to help alert a wider public to what was coming down the road in terms of human applications of developmental biology. In a society with democratic values it should be inarguable that those who pay for scientific research and will eventually experience its effects should be informed of what is in store while there is still a chance to discuss its objectives and influence its course. As a researcher myself, moreover, I was not oblivious to the possibility of a backlash against my field if it was seen to have violated the social trust. Dr. Newman’s expectations about the line of biological development in this area were correct. In 2003, the first human-nonhuman chimera was created by Chinese scientists, in that instance between humans and rabbits (embryos were allowed to develop only for several days before being destroyed). This has been followed by creations of chimeric human-sheep, human-pig, human-mouse, and other human-nonhuman embryos. But the Weldon Amendment has been limited to the channeling of federal research funds. Today, with enactment of the America Invents Act, the U.S. government has gone farther by declaring that “[n]otwithstanding any other provision of law, no patent may issue on a claim directed to or encompassing a human organism.” It is worth noting that this is generally consistent with the approach taken by other countries, and that this provision of the Act removes not only human-nonhuman chimeras from being patentable, but also affects other areas of research involving human embryos and fetuses. While the Act does not make it unlawful for researchers to investigate human-nonhuman chimeras, the result remains important since it removes one of the primary legal mechanisms that would make such research profitable. The last time Congress overhauled the patent system in 1952, it proudly and poetically declared its intention to allow patents on “anything under the sun that is made by man.” Today, it limits that a little, but in a way that few find objectionable.